We’d love your help. Let us know what’s wrong with this preview of Irresistibly Yours by Andrea Boyd. Marriage is no picnic. At least the one Vivian Emerson shared with her late husband hadn’t been. Unfortunately, the devastation Craig had brought into her life didn’t ended with his death. Not only did he leave Vivian without closure, he had to go and die in a way that made her the talk of the whole state of South Carolina and beyond. Now her daughter wants nothing to do w Marriage is no picnic. At least the one Vivian Emerson shared with her late husband hadn’t been. Unfortunately, the devastation Craig had brought into her life didn’t ended with his death. Not only did he leave Vivian without closure, he had to go and die in a way that made her the talk of the whole state of South Carolina and beyond. Now her daughter wants nothing to do with her because of him. She would just stick with the single life from now on, thank you very much. For the last fourteen years since the death of his wife, Bo Manning never even considered wanting another woman in his life. That is until he comes to the rescue of a certain woman with haunting, jade green eyes. Despite Vivian’s resolve not to give her heart to another man, Bo sets out to patiently woo her into the loving relationship he is offering. To ask other readers questions about Irresistibly Yours, please sign up. First, I must say that Bo Manning – the hero of our story – is quite swoony and seems to be quite the toe-curling kisser! And the fact that he’s an older hero (NOT old) gives his swooniliciousness some maturity which is also quite yummy. He’s also just an all-around good guy, with a tender heart and a close relationship with Jesus. He values Vivian from the moment he meets her and his gentle wooing of her is a sweet picture of Jesus’ pursuit of each of us. It’s not all tragedy-recovery or sweet romance, though. There’s also a healthy dose of humor that may leave you chuckling out loud. Aaron’s corny but hilarious jokes, for instance. Or the neon sign incident – my personal favorite! Irresistibly Yours is an irresistibly delicious story! While most contemporary romances feature couples in their mid-twenties or thirties, it is refreshing and exciting to come upon a gem like this one with a vibrant prospective "second-chance at love" couple. Vivian Emerson has been through the wringer thanks to her late husband and grief-stricken daughter. Bo Manning is a pillar of strength and natural-born protector and quite attractive at that. The Walden Beach community is a sweet little resort town and oh so appealing. This romance is full of humor, healing, and chivalrous wooing. I'm looking forward to more stories from this author! Irresistibly Yours, written by Andrea Boyd, is the picture of a classy romance! Loved the way Boyd brought her fun pen out when she wrote this romance. Not a Christian romance in the perfect gift box. I loved the fact that this isn't a young love-at-first-sight kind of read and shows how marriage isn't for wimps. Favorite character -- by far, Bo! Boy, if I have a friend who has to go what Vivian has gone through to get to this point in her life...I want a Bo waiting at the other end to woo her! S Irresistibly Yours, written by Andrea Boyd, is the picture of a classy romance! Favorite character -- by far, Bo! Boy, if I have a friend who has to go what Vivian has gone through to get to this point in her life...I want a Bo waiting at the other end to woo her! Sure, not every romance is picture perfect nor are these characters. They've had the hard knocks and yet still haven't lost faith that God is in control. Lovely read! Definitely a great read for middle-agers who want to read something in their age bracket without feeling too old. But also great for any age to see that God isn't finished with anyone yet! I love a book with characters who have a bit of life experience (especially since I have some life experience myself). And in Andrea Boyd delivers in Irresistibly Yours. Vivian and Bo have each lived through some difficulties—loss of a spouse, estrangement from family, and more. As Vivian endeavors to find herself after humiliation and tragedy, Bo knows exactly what he wants and proves he’s the best type of man. A man who commits to a friendship while placing anything more in God’s hands. This is I love a book with characters who have a bit of life experience (especially since I have some life experience myself). And in Andrea Boyd delivers in Irresistibly Yours. Vivian and Bo have each lived through some difficulties—loss of a spouse, estrangement from family, and more. This is a book about second chances and about leaving our futures—and those of the ones we love—in God’s hands. 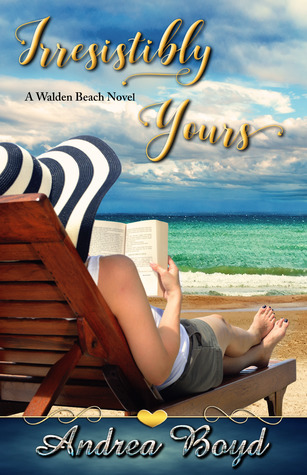 Set in a quaint Carolina beach town amongst tourist shops, sea, and sand, Irresistibly Yours invites you to visit but beckons you to stay. The good news is there are plenty of people to write about. Let’s hope we get to return to Walden Beach and it’s eclectic mix of residents. What a wonderful refreshing story! I really loved Andrea's take on love a second time around. I adored Bo, and the setting is amazing. One conversation with a friend plus a series of dreams and Bo Manning was born. Oh man, is he good-looking! And sweet. And he’s faithful. He’s a great dancer, and wow, is he a great kisser. Who could resist, right? Well, Vivian Emerson gives it her best shot. After everything her late husband put her through, she has no desire to try again. Will she be able to stick with her plan for the single life? I hope you enjoy this Southern contemporary romance with a beach setting. It’s about friendship, One conversation with a friend plus a series of dreams and Bo Manning was born. Oh man, is he good-looking! And sweet. And he’s faithful. He’s a great dancer, and wow, is he a great kisser. Who could resist, right? What a sweet story about second chances! It was nice to read a story about a couple in their 40s. I really liked Vivian. Despite being badly wronged, she showed nothing but kindness and grace. What she did with the money she made from selling Craig’s car was pretty amazing. She had some serious trust issues, but after the way her husband had treated her, that was to be expected. My favorite thing about Bo was that he painted his wife’s toenails when she could no longer do that for herself. I also thought it was great the way he was so focused that he didn’t let distractions get in the way of him achieving his goals. Without giving any details as to why, because it would spoil the story, Lucas is possibly my favorite character. I love that God taught her a spiritual lesson through a stray cat. I know that God loves cats and having been adopted by a stray cat myself, I related quite well. "I'm not interested in another marriage. The one I had almost did me in. " It seems that Vivian Emerson has met a super hero. Coming to her rescue on more than one occasion, Bo Manning seems less and less like a stranger, and more and more like a modern day superman. His calm, genuine demeanor makes Vivian ponder how he might fit into God's plan for her new beginning in Walden Beach, South Carolina. The death of her unfaithful husband dramatically tilted her world, estranging her daughter and lea "I'm not interested in another marriage. The one I had almost did me in. " It seems that Vivian Emerson has met a super hero. Coming to her rescue on more than one occasion, Bo Manning seems less and less like a stranger, and more and more like a modern day superman. His calm, genuine demeanor makes Vivian ponder how he might fit into God's plan for her new beginning in Walden Beach, South Carolina. The death of her unfaithful husband dramatically tilted her world, estranging her daughter and leaving Vivian with a restlessness that she doesn't know how to dissolve. Bo Manning has been a widower for quite some time, never even having a desire to date again, quite content to be a father and grandfather while managing his business, "Manning's Garage". When a lovely out-of-towner gets stuck in a busy intersection, Bo answers her call for help, only to wonder if he has just met "the rest of his life". Imagine warm sunshine on your face and long walks on the beach, as Andrea Boyd sends you on a delightful excursion into the world of second chances. Irresistibly Yours is a romance like no other. One, the couple is in their 40s and I absolutely love that! Second, their's a sweetness and slow build that has you anticipating on every page. This is a great book and a promise to a greater series. I love books that are entertaining but also make me think. This was one of those books. The characters were believable and entertaining. The plot was thoughtful and well written. A perfect lazy day read. Vivian Emerson's life looked perfect until tragedy blew it apart. Instead of turning to each other in their grief, she and her husband grew apart. After nearly 10 years of that, her husband dies in spectacular fashion on their reconciliation weekend, leaving her to endure the sneers of the whole state because of the way he died. After a year of closing herself off from life, Vivian decides a change is in order. First stop? The hairdresser, where she loses six inches of hair. Second stop? Her gra Vivian Emerson's life looked perfect until tragedy blew it apart. Instead of turning to each other in their grief, she and her husband grew apart. After nearly 10 years of that, her husband dies in spectacular fashion on their reconciliation weekend, leaving her to endure the sneers of the whole state because of the way he died. After a year of closing herself off from life, Vivian decides a change is in order. First stop? The hairdresser, where she loses six inches of hair. Second stop? Her grandmother's duplex on Walden Beach. What she needs is some beach therapy and to sell her husband's vintage GTX. What she gets is a broken-down car in a Walmart parking lot, and a gorgeous mechanic with strong shoulders to cry on. Bo Manning's wife has been gone for fourteen years. He hasn't dated since, in spite of women practically throwing themselves in his path. When he's called out to pick up a GTX at Walmart, he first notices the amazing car, then, the green-eyed, gorgeous woman driving it. When she falls apart, what's a guy to do but offer a hug of reassurance? He knows she's a tourist so he'll probably never see her again, but, wow, she's the woman he'd want to break his dating fast with, if she was staying. After a week at the beach, Vivian decides to move there. She had inherited the house, after all, and, as an author, she can work from anywhere. Can she keep her "no dating, no men" rule when it's Bo who decides to woo her? Traumatized by the actions of her husband, she is overly cautious where other men are concerned. What will it take for her to see that Bo is the definition of faithful? I read Persuaded first and loved it, then realized that Irresistibly Yours was actually the first book in that series. This one was, if possible, even more beautiful than the first one I read. Every woman who endures what Vivian did in her marriage, should have a Bo Manning at the other end! He was an amazing hero for this book - strong yet gentle, loving, kind, thoughtful, and it didn't hurt that he was gorgeous. This is the first book by Andrea Boyd that I have read and it was a wonderful journey. It is a fun book, filled with a nice plot, strong and lovable characters, and a great faith-filled theme of redemption, forgiveness, and God’s gentle yet persistent and relentless pursuit of our hearts. Vivian is a widow, having been hurt by her deceased husband and now estranged from her only daughter. She moves to the beach town to the home she inherited from her grandmother to start a new chapter in her lif This is the first book by Andrea Boyd that I have read and it was a wonderful journey. It is a fun book, filled with a nice plot, strong and lovable characters, and a great faith-filled theme of redemption, forgiveness, and God’s gentle yet persistent and relentless pursuit of our hearts. Vivian is a widow, having been hurt by her deceased husband and now estranged from her only daughter. She moves to the beach town to the home she inherited from her grandmother to start a new chapter in her life. She’s spunky, creative, loving, kind, and gentle but has a lot of trust issues regarding men. Bo is a mechanic who’s been widowed for the last 14 years and remained happily single. He’s faithful, kind, thoughtful, loyal, loving, passionate and tender-hearted. Mutual friends and circumstances bring the two together and Bo must woo her slowly to gain her trust. I loved that the author illustrates how God woos our hearts through Bo’s patient, gentle, and loving courtship of Vivian. I also loved that the main characters are a bit older (in their forties) and able to see through more mature eyes. Anyone who enjoys contemporary Christian romance will love this book. Book is light and interesting. The relationship with bo and vivian shows pain from past hurt. Bo is patient as Vivian struggles to come to grips with her many positive and negative feelings.I like how the author ties in the need for Vivian to forgive Craig and her estranged daughter. When her daughter appears after years of np relationship Vivian is forced to ask herself to forgive her when she says sorry and says shrubs pregnant.wha Book is light and interesting. The relationship with bo and vivian shows pain from past hurt. Bo is patient as Vivian struggles to come to grips with her many positive and negative feelings.I like how the author ties in the need for Vivian to forgive Craig and her estranged daughter. When her daughter appears after years of np relationship Vivian is forced to ask herself to forgive her when she says sorry and says shrubs pregnant.what would you do if someone hurt you. A book that has real life situations that some people deal with everyday. Burned by marriage Vivian didn’t think she ever wanted to be married again. Wonder if Bo can woo her and win her over? Read and find out. An enjoyable and entertaining read. If you like a good Christian romance this book is for you! I received a free copy from the publisher but all opinions are my own. Irresistibly Yours is a book about a second chance for happiness sprinkled with forgiveness, acceptance, and trust. Vivian is a widow finally ready to move on with her life. She is making many changes in her life including the decision that she isn’t willing to chance another relationship. God has other plans and puts Bo in her path. Bo has been a widower for some time and has never had any interest in another relationship until he meets Vivian. I was right there with Vivian all the way completel Irresistibly Yours is a book about a second chance for happiness sprinkled with forgiveness, acceptance, and trust. Vivian is a widow finally ready to move on with her life. She is making many changes in her life including the decision that she isn’t willing to chance another relationship. God has other plans and puts Bo in her path. Bo has been a widower for some time and has never had any interest in another relationship until he meets Vivian. I was right there with Vivian all the way completely understanding where she was coming from but very glad that things turned out the way they did. It is so refreshing to read a book about “older” and wiser people who have already lived but still have lots of living left to do. I enjoyed this book about a woman who is recovering and moving on from a marriage that ended badly. Vivian moves to the beach for her new beginning and meets new friends who help her move on with her life, including a new man Bo. It is a sweet story of the Lord's redemption. This a great book with about love after having your heart broken. I've enjoyed many of Ms. Boyd's book and this in an other stunner. Note: If you are a reviewer who would like a free eBook copy of Securing Aisling, just ask for it! If you have a website and would like to give away an eBook copy of Securing Aisling, just ask for it! I am just getting started and I'm really flying by the seat of my pants here, so if you have any ideas of how I can promote my book, feel free to contact me. Any help is appreciated. I mainly read Chri Note: If you are a reviewer who would like a free eBook copy of Securing Aisling, just ask for it! If you have a website and would like to give away an eBook copy of Securing Aisling, just ask for it!